which is the dimension between the 2 flanges on the rear bearing that fits on the case. Please measure the case for this measurement! The 2nd number in the part number is the over size bore that the case was align bored to. 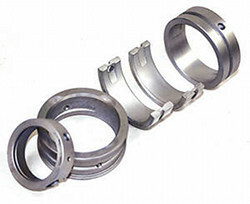 we offer bearing in the following overs sizes. The 3rd and final number is the crankshaft main journal measurement! 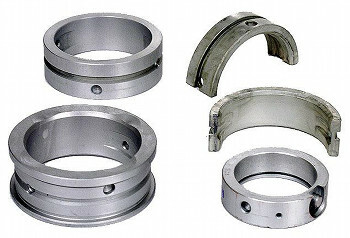 Type 4 Main Bearings 021-198-483A . MAIN BEARING TYPE 1 1200CC-2332CC 111-198-463 .010"
VW MAIN BEARING SET .010"
MAIN BEARING TYPE 1 1200CC-2332CC 111-198-465 .020"
VW MAIN BEARING SET .020"
MAIN BEARING TYPE 1 1200CC-2332CC 111-198-467 .030"
VW MAIN BEARING SET .030"
MAIN BEARING TYPE 1 1200CC-2332CC 111-198-469 .040"
VW MAIN BEARING SET .040"